The object zoomed by my face so quickly I almost missed it. The familiar collision of plastic against wall jolted me. Escape. Thoughts of turning to flee the church nursery whizzed through my head. Is there any place to escape the spinning, dropping, banging, sloshing excitement that is bottle flipping? “It was a capper on the first try, Mom!” Breathless my five-year old stands beaming at me. That bottle that had zoomed past my unexpected presence at the nursery door had landed upside down, on its cap in the middle of the changing table. “That was so awesome!” chimed in my seven-year old. My choice words for the experience were better left unspoken, and thankfully in that moment my brain knew enough to keep my mouth shut. “A weary world rejoices.” Words to a familiar Christmas song drift into my thoughts. As silly as it sounds, this bottle flipping business has worn me down as a mom. The tension between my weariness and my boys’ celebration at each landed trick wears me down. My saving grace each day comes with the bedtime declaration that bottles need to be on the kitchen table as my kids start their bedtime routine. 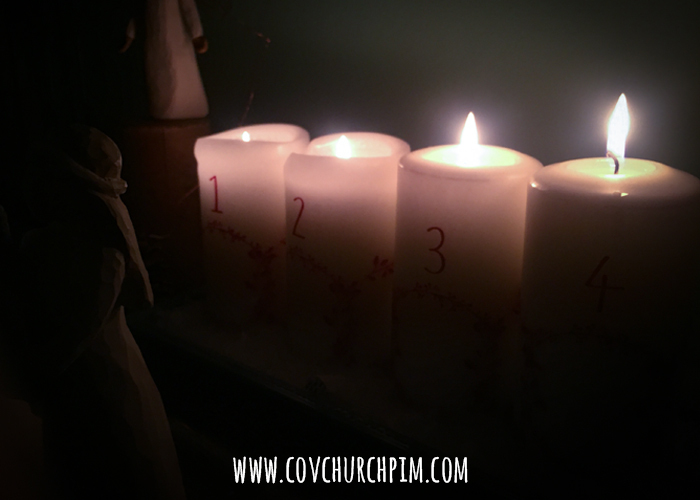 As we walk through the Advent season, we are starting our new year. We stand at attention, staring December straight in the face. “A weary world rejoices.” We lament over our weariness, our need for a savior, our desire for restored hope, erased pain, and renewal. We are a weary world, yearning to be in a place where we can rejoice. Unexpected deaths, unexpected funerals, unexpected grieving … A weary world. Refugees, a world away, fleeing as the familiar world crashes down … A weary world. An empty bank account, a pile of bills, a lost job, disappointment … A weary world. Harsh words, fighting words, confusion, conflict, hope, an election … A weary world. Illness, fatigue, addiction, mundane routine … A weary world. Chaos, clutter, repetitive noise stealing the silence … A weary world.